The highly efficient Aroma 6 cup rice cooker is dedicated to cook 2-6 cup of delicious rice simply at the press of a button. A perfect blend of form and function, Aroma ARC-753SG is a cooker which has automatic switching which keeps the rice warm until it is finished cooking. 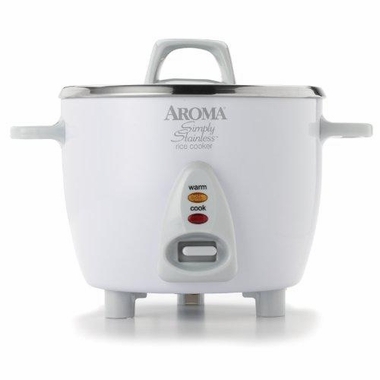 The Aroma 6 cup rice cooker is dishwasher safe and easy to operate with touch of a button. The Aroma ARC-753SG is great for soups, stews, chili and more, the cooking pot is carefully designed with surgical quality 304 stainless-steel for effortless cleaning, strength and reliability. To make your operations easier, the cooking pot is removable once you are done with your cooking and can be assembled easily. The Aroma stainless steel rice cooker is a well-made and reliable cooker never leak and gives you years of trouble free use.